Are you a vacation planner or more of a “go with the flow” traveler? Either way, it's always great to take off and enjoy the sights and experiences the world offers. A few tips to ensure staying healthy is part of your vacation agenda can make a BIG difference. I’ve learned a few things over the years as I road trip with my nieces and nephews. We spend time learning new skills and taking on adventures – such as stand-up paddle boarding, hiking Crystal Mountain, and sea kayaking on an Orca Reserve (it’s so fun to be the cool aunt). But, because these are “borrowed” children I must return them unharmed and healthy. I’m sharing 7 tips to plan health into your travels without spoiling the fun! Vacation is meant to deliver some rest and recharge, right? However, this is easier said than done. From going to Disneyland all day, to taking in the sites around Washington DC or hiking Mt. Rainer in the Pacific Northwest, if you’re not careful to plan some rest, you may need a vacation from your vacation. I suggest starting off early with a morning adventure to beat the crowd and plan a bit of down time in the afternoon (naps, relaxing next to the pool, or a couple hours of “device time”). Then, you’re ready to spend your evenings back on the town. The afternoon break not only gives you a chance to rejuvenate, but also helps you beat the heat. Lots of walking, hours in the sun, and just traveling, in general, can be exhausting. Those things don’t improve dehydration, either. While carrying a water bottle around is highly recommended, I’ve found kids consider them heavy and a burden. Try packing some fun, disposable drink options that aren’t full of sugar and caffeine, as well as fruits that are high in water content like watermelon, berries, pineapple, etc. Yum! Tasting the local cuisine is part of the fun while traveling. Imagine sitting at a table with butcher paper, a mallet and a bib when the waiter walks over and pours out a pot full of fresh seafood, potatoes and corn, all steamed to perfection. This is no time to stick with a salad! However, having healthy snack options readily available can balance some of the other cuisine splurges that often come with vacation. I tote healthy on-the-go snack options such as apples, nuts, trail mix, carrots and celery, protein bars, turkey jerky, etc. Variety is always a good idea! During one of our summer adventures, my nephew stepped out of a public restroom in the Iowa Living Farm Exhibit and exclaimed, “I did not need to wash my hands because I did not touch my ‘weewee.’” Ahem. Through my embarrassment, I quickly explained otherwise. Seriously though, this is where my inner nerd comes out for all to see. I wipe down EVERYTHING with antibacterial wet wipes, including airplane seats and trays, car door handles, and certainly little hands after they’ve used a public restroom. Water and soap aren’t always readily available when traveling, so having some alternatives is a life saver. It’s not a good idea to send my sister-in-law a lobster from Oregon, especially when it was formally known as her 13-year-old daughter. I don’t know about other people’s kids, but my nieces and nephews don’t love the sticky feel of sun screen. And, they weren’t that into wearing hats. So how do you make it fun and safe? To kick off every trip, I buy them a new hat (emphasizing the souvenir angle – and what teenager doesn’t love “new” for about a week?). You can do the same thing with a good pair of sunglasses. Add in a range of sunscreen options from rub-on sticks to sprays in a variety of SPF options and you’re set. Pre-planned footwear is a must! Do NOT send your child to travel with me in a pair of flip flops (unless we’re going for a pedicure ). Think through your activities and make a list of must-have shoes for your travels. Sore feet and blisters can really ruin the fun. But, if your teenagers struggle to comply with certain shoe requests – like my 16-year-old niece who thought she’d die of embarrassment in her Keens – just promise not to take photos that include their feet. Put down the technology, load up the car or head to the airport, and go find your next adventure. Have fun and stay healthy! Now it’s your turn! Do you have a health tip to share with summer travelers? 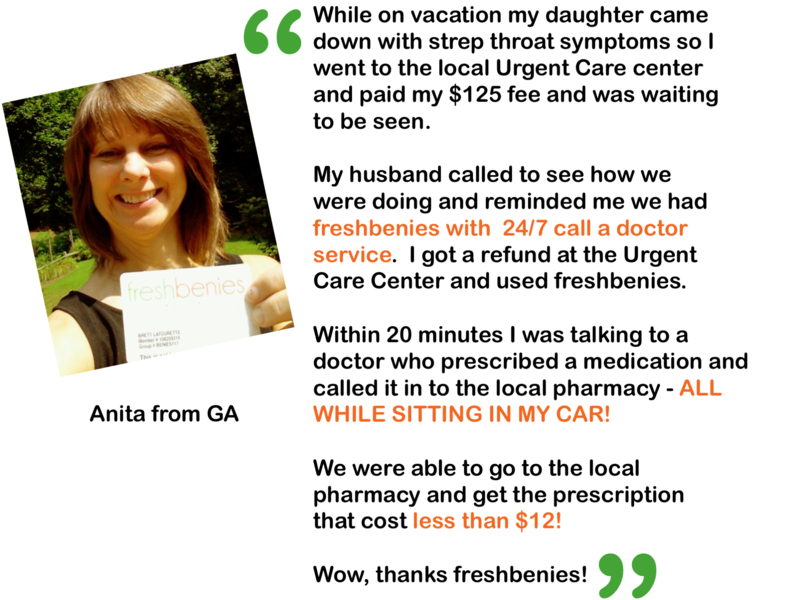 Comment below or email me at tonia@freshbenies.com.